Obviously the answer is D (duh!). statement necklace (for the chic factor) and you are set! The bright pops of red look so stunning! Love the look! love the pops of red and your chain necklaces! I adore this look and I am now lusting for a bright red cross body bag!!! Absolutely love the casual cut of those jeans. And that bag is absolutely drool-worthy! I really need to get myself a good utility jacket, haha...I always find myself wanting to wear one but I don't have it! this is essentially my work uniform- love everything about it on you! Such a great look! Love your pumps! Fun pumps and a statement necklace can totally transform a look for sure and yours are amazing! This jacket is absolute perfection! Such a chic casual look :) Always love a good distressed denim...and the pop of red in the heels is awesome!! Love this look. Distressed denim and heels is always a casual chic look. I love the lose fit tee you paired with it, comfy chic! 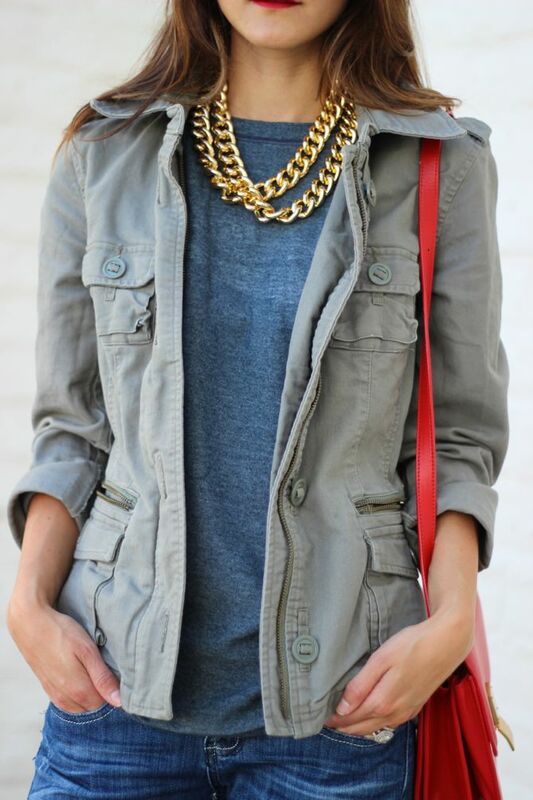 Love your outfits, the gold chain necklace with a t-shirt is the perfect combination!! i love these jeans. they look more distressed on you then online. did you do any distressing and did you go a size up for the slouchiness or do they fit this way true to size?